Bill Cramer is best known for his striking oil paintings of the American West. Growing up in the west, Bill always had an interest in exploring nature and creating art. As a longtime rock climber, he spent much of his youth enjoying the more vertical aspects of the landscape. 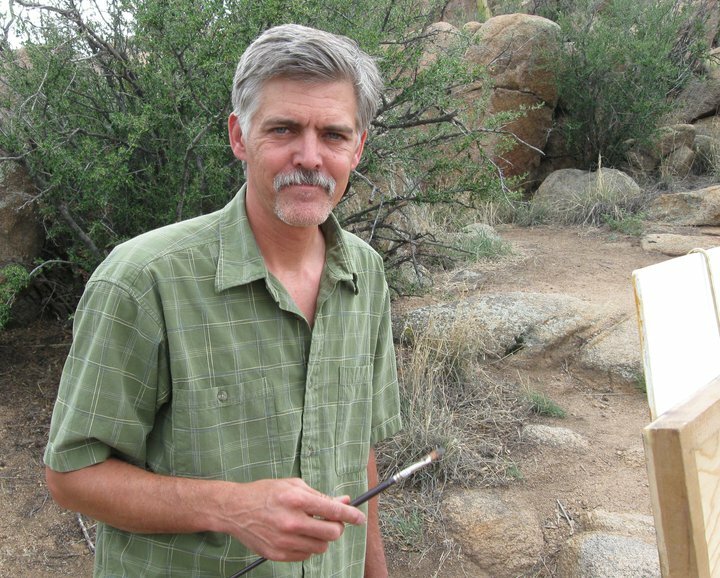 After receiving a University of California fine arts degree, he moved to Arizona with his wife Michelle to be closer to the scenery they both enjoyed. It was there that he discovered the delight and challenges of plein air painting, his outdoor experiences providing much of the insight and inspiration for his landscape paintings. Bill works in a style best described as Impressionistic Realism, where strong brushwork and colors are used to express the vitality and beauty of the natural world. •	Borrego Springs Plein Air invitational (2019), Borrego Springs, CA. Artist’s Choice Award. •	Oil Painters of America Annual Salon Show (2018), Landscape Award of Excellence. •	Phippen Western Art Show (2018), Best in Show, 1st in Oils and Art of the West Award of Excellence. •	Zion National Park Plein Air Invitational (2017), Zion NP, UT. Artist’s Choice & Zion Forever Project Poster Award. •	Sedona Plein Air (2017), Sedona, AZ. Best in Show Award. •	Sedona Plein Air (2016), Sedona, AZ. Artist’s Choice Award. •	Phippen Western Art Show (2016), Prescott, AZ. Best in Show, 1st in Oils & Best Body of Work Award. •	American Impressionists 16th Annual Juried Exhibition (2015). Southwest Art Magazine Award of Excellence. •	Phippen Western Art Show (2015), Prescott, AZ. 1st in Oils. •	Sedona Plein Air (2014), Sedona, AZ. Best in Show, Artist’s Choice & Collector’s Choice Awards. •	Grand Canyon National Park Plein Air Invitational (2014), Grand Canyon NP, AZ. Artist’s Choice Award. •	Zion National Park Plein Air Invitational (2013), Zion NP, UT. Artist’s Choice & Purchase Awards. •	Phippen Western Art Show (2013), Prescott, AZ. 1st in Oils & Best in Show. •	Zion National Park Plein Air Invitational (2012), Zion NP, UT. Two Purchase Awards. •	Grand Canyon Plein Air on the Rim (2012), Grand Canyon NP, AZ. Artist’s Choice Award. •	Telluride Plein Air (2012), Telluride, CO. Best in Show. •	Phippen Western Art Show (2012), Prescott, AZ. 2rd in Oils & Best Body of Work Awards. •	Grand Canyon Plein Air on the Rim (2011), Grand Canyon NP, AZ. Artist’s Choice Award. •	Sedona Arts Center Juried Members Show (2011), Sedona, AZ. 1st in Oils & Best in Show. •	American Impressionists Society Juried Exhibition (2010), Nashville, TN. Award of excellence. •	Sedona Plein Air Festival (2009), Sedona, AZ. Artist’s Choice Award.